Last week the title of my article was FALL back in deference to the clock change-this week it refers to Veterans Day. Most of us are not veterans of the military but probably ALL of us know a few! At my grandchildren's elementary school they ask every student to bring in a picture of parents and/or grandparents who have served in the military to be posted on their "Wall of Honor!" They then celebrate Grandparents day in conjunction with this holiday. It is really special to see our grandkids pose in front of the Wall next to their "Papa's" picture from years gone by. I have always thought this was a great way to both honor our veterans and teach our students just what that day means. The school also encourages each class to do some kind of project to "give back" to their community just as the veterans gave of themselves as they served in the military! Does your school/district have a unique way to honor our veterans? Post it on our CASE Facebook page! Or tweet it and use the hashtag #casecec. Speaking of Hashtags ... Did you know that if you go to the CASE website, you will see the running tweets from CASE and those that use the #casecec? I would urge you to start a twitter account, even if you don't ever decide to actually "tweet!" Just follow some of the "big" education names/associations and you will see quickly that this is a great medium for getting current information. It is a good way to keep your finger on the pulse ... you don't have to have followers to tweet but you can learn a lot from following others! And speaking of getting current information ... As you read this update, the CASE office has already arrived in San Antonio for the Fall Executive committee meeting, Board of Directors meeting, and the 25th Annual CASE conference where we are sure to get a plethora of current information! We are so excited our fall Board of Directors meeting, Nov. 12-13, in San Antonio will have 37 of our 40 subdivisions represented, including both of our Canadian units! This representation is critical for CASE to truly be your voice! Make sure your voice is heard by contacting your subdivision president and letting them know what is important to you! One of the things we will be giving out at the BOD meeting this year is our CASE Biennial report. All members will be able to download the report after Nov. 17 behind our Members Only section. If you go there now, you can download a copy of the 2010-2012 and the 2008-2010 reports. Or if you would like a hard copy, you can contact the CASE office to purchase one for $5. Have you learned all you need to know about Results Driven Accountability? I am betting not. The 4th Annual CASE Hybrid conference, Feb. 19-20 is going to be all about RDA! As it relates to student achievement and as it relates to legal issues and as it relates to partnerships! Click here for the flyer on the conference — remember you have two options: travel to the wonderfully warm Phoenix, Arizona, or be the host site for a virtual conference — same low price — and for just $50 you can have the DVD of the complete conference to use over and over and over! Watch the CASE website for registration and additional information in the days to come! Speaking of Accountability! 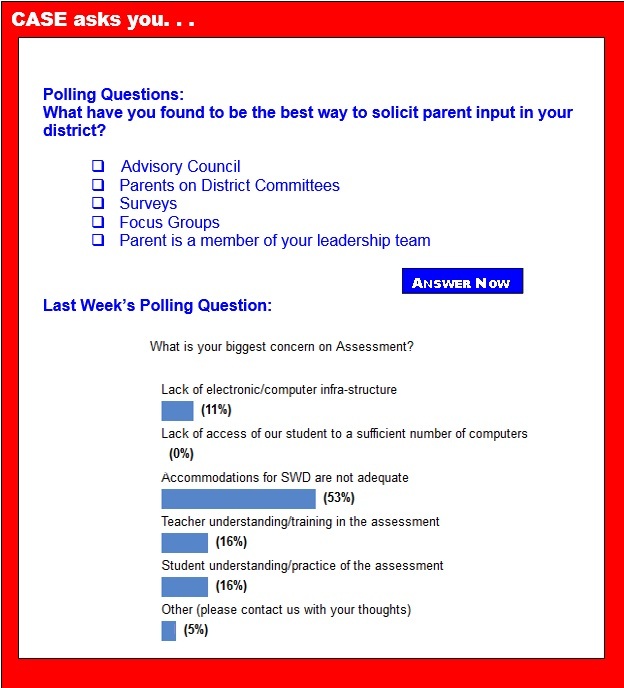 Last week's poll was about what your biggest concerns are about assessment — can't really be accountable without assessment, can you! Over 50 percent of those who answered the poll said their biggest concern was the accommodations for students with disabilities are not adequate. There was a tie for the next biggest concern — 16 percent of those who answered the poll said Teacher understanding/training and student understanding/practice were their biggest concern. I was personally a little surprised that only 11 percent were worried about the amount of electronic/computer infrastructure but it follows since no one was concerned about lack of access to computers for students. Be sure you answer this week's poll. It is helpful to the CASE committee chairs to see the answers. We are always looking for great polling questions, so if you have one, send it our way! Please mark your calendar! On Tuesday, Dec. 2 from 2:00 p.m. to 3:30 p.m., the Youth Transitions Collaborative, in partnership with the U.S. Department of Education, Office of Special Education and Rehabilitative Services will host an educational webinar entitled, Determined to Succeed: Preparing for Postsecondary Education and Employment. The following Applications for New Awards; Personnel Development To Improve Services and Results for Children With Disabilities; Personnel Preparation in Special Education, Early Intervention and Related Services was published in the Federal Register on Wednesday, Oct. 22, 2014. Student assessments drive education. Academics are carefully measured with every student to determine at what level he is learning and if any interventions are needed to assist him for improved learning. If a student demonstrates learning difficulties that persist after a systematic plan of interventions has been used and measured, the student may be referred for special education services. It is at this point that a student is examined in a deeper manner. The brains of children with dyslexia may be structured differently, according to neuroimaging of the thalamus, the part of the brain that serves as its connector. The behavioral characteristics of dyslexia — a reading disorder that affects up to 17 percent of the population — are well documented, including struggling to recognize and decode words as well as trouble with comprehension and reading aloud. Jennifer Craig stared at her daughter's fifth-grade math homework. It was a three-digit multiplication problem, and it seemed simple enough. But her 10-year-old was supposed to solve it by drawing a chart, breaking apart numbers, multiplying, adding and maybe more. "I'm lost," said Craig, a 31-year-old stay at home mother of three. And that's how she found herself in her daughter's classroom Monday night, sitting alongside other parents in child-size chairs and listening as teacher Alyshia Thomas explained new math strategies. While listening to a dyslexia interventionist specialist this spring, Tracie Luttrell started to see the faces of students who were struggling in her elementary school — faces of past students who never really thrived but ones Luttrell knew were intelligent. It was a light bulb moment for the educator. "I knew right then there was something we could do for these students," said Luttrell, principal at Flippin Elementary School. Do you know where your student is? At school? On the bus? Paying for lunch in the cafeteria? Principals in thousands of the nation's schools know the answer because radio frequency chips are embedded in students' ID cards, or their schools are equipped with biometric scanners that can identify portions of a student's fingerprint, the iris of an eye or a vein in a palm. Such technologies have become increasingly common in schools, which use them to take attendance, alert parents where their children get off the school bus or speed up lunch lines. The large majority of U.S. public school teachers, 76 percent, react positively to the primary goal of the Common Core — to have all states use the same set of academic standards for reading, writing and math in grades K-12. However, this positivity fades when the topic turns to using computerized tests to measure student performance (27 percent) and linking those test scores to teacher evaluations (9 percent). A little over half of high school students with attention deficit hyperactivity disorder are receiving some kind of services from their schools, such as additional time on tests or extended time to complete homework assignments, a recent study finds. But those particular supports have no reported effectiveness in improving the academic performance of students with ADHD, according to the study published in the journal School Mental Health. There are substantially more students per every teacher in California than there are in Vermont. New data released this week from the National Center for Education Statistics shows how student-teacher ratio varied by state in the 2012-2013 school year. On average, there were 16 students per every public school teacher in the country that year. Some psychologists and child development experts are concluding that many efforts to thwart bullying in schools and online have failed. New approaches are needed, they say, and the key to reducing bullying is instilling emotional intelligence in children early, as a preventative measure against becoming a bully or being victimized by one. Kelli Sandman-Hurley, a contributor for Edutopia, writes: "The following passage is about dyslexia. I want you to assume that I will be asking you a comprehension question or two when you are done. You have one minute. Go! The bottob line it thit it doet exitt, no bitter whit nibe teotle give it (i.e. ttecific leirning ditibility, etc). In fict, iccording to Tilly Thiywitz (2003) itt trevilence it ictuilly one in five children, which it twenty tercent." According to the National Center For Learning Disabilities, one in five kids have learning and attention issues. These two PSAs give parents a glimpse into what it's like inside the minds of their kids with learning and attention problems. The ads show parents asking their Siri-esque smartphone assistants questions about their children's problems with school and learning — only to be constantly misunderstood and given answers to completely different questions. What is your district's biggest impediment to learning? Mike Looney: "Our biggest impediment is lack of time," says Looney, superintendent of Williamson County Schools in Tennessee. "We're asking students and teachers to accomplish more and to master more content than ever before." What we're doing is being creative and trying to find ways to expand opportunities for kids. We're doing before- and after-school programming. Some of our schools are actually piloting extending the school day.